How does belief influence the way people approach death? Why don’t those who believe they’re going to heaven seem that keen to go? And how is belief changing, in an age where tweets address the dead, and many who say they have no faith believe in an afterlife? 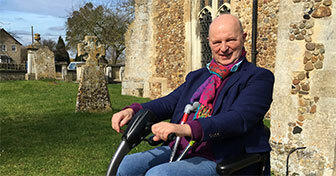 We hear from Rick, who has a motor-neurone condition with a terminal prognosis, about how his faith affects his approach to death. Katie Harrison from ComRes shares their research into UK patterns of belief. In the studio we’re joined by Toby Scott from Hospice UK and palliative care nurse Katie Cantlay, and on the line by Tony Walter, Professor of Death Studies at the University of Bath. The podcast is released on Good Friday – marked by Christians as the day when Jesus Christ was put to death by the Roman authorities on a cross. It’s an event which, along with his resurrection three days later, is central to their faith. Through this event, according to the Bible, death is in some sense defeated, with a promise of eternal life. And for people of other faiths, and many of none, death is not the end, but merely a route to a new kind of existence. This was a very interesting and wide-ranging discussion about how we can approach death. Rick’s calm and peaceful acceptance of the inevitable will be a comfort to many. A living Christian faith does make a difference; it is in marked contrast with a neighbour’s experience of extreme anxiety in her weeks before death. Holy week reminds us that Jesus prepared for his death. The final discourses in John’s gospel, particularly in the ‘I am the true vine’ allegory, urge us to consider our personal relationship with the Godhead. Once established, that inextricable relationship has every probability of continuing as we pass through the gateway of death to eternal life. Love never ends.